Of course, there were a number of events connected to his welcoming and arrival, and the Holy Father's talks, particularly on Friday, were beautiful. There were about 30 American bishops with us in Panama and, as I mentioned last week, the U.S. had the largest delegation of any single nation at World Youth Day, except, of course, for Panama. The theme was "Be It Done to Me According to Thy Word," and they even had rubber wrist bracelets with that phrase on them. 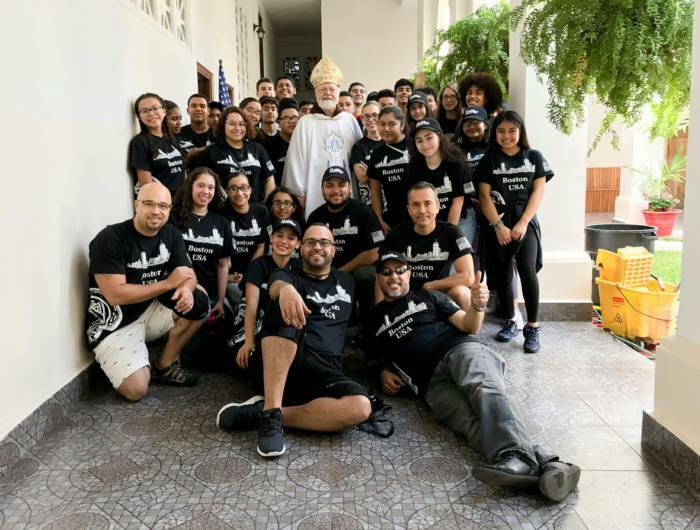 On Saturday morning, before the vigil with the Holy Father, I gathered with all the pilgrims from Boston attending World Youth Day at the Church of Our Lady of Carmen, a beautiful Carmelite church in the center of Panama City. In addition to the group traveling with the archdiocesan pilgrimage, there were parish groups from Revere, Lowell, Marlborough, East Boston, and the cathedral, who are part of the Neocatechumenal Way, the LifeTeen Group from Hanover and Norwell, and a group from the Brazilian community at St. Tarcisius Parish in Framingham. There were about 200 pilgrims from Boston with us at the Mass -- more than I had been expecting. On Saturday afternoon, we gathered with the Holy Father at Metropark. We were blessed with the weather because, although it was hot, we had no rain. The vigil on Saturday evening was impressive. There were a number of testimonies given by individual young people about their faith. There was also a testimony of a family, who spoke about their daughter who has Down syndrome. There were several musical numbers and then the Holy Father gave a talk, which was followed by adoration of the Blessed Sacrament. It was inspiring to see hundreds of thousands of young people in complete silence during the adoration. Our pilgrims from Boston stayed overnight on the site, though we bishops headed back into the city until about 3:00 a.m., when we headed out again to attend the Sunday morning Mass. At the Mass, I met the pastor of Easter Island, Father Bernardo, who sought me out. He himself is a member of the native peoples of Easter Island, the Rapanui, and told me he is the only Rapanui priest in his archdiocese. They gave me a necklace and a flag because they knew that Easter Island was my first assignment and they are still waiting for me to come and be the assistant pastor there. As we concluded, the Holy Father made the announcement that the next World Youth Day will be held in Lisbon, Portugal. There were a number of Portuguese there, including the patriarch of Lisbon and the head of the Portuguese bishops' conference. I spoke to the patriarch, and he told me that there is great excitement in Portugal over hosting World Youth Day in 2022. He told me that one of the ideas he has is to reach out to the Portuguese speaking countries in Africa and, hopefully, bring many young people from that part of the world. They also have a close relationship with Cape Verde and Brazil. The presence of Fatima also makes Portugal an attractive location for World Youth Day.